The BYU Women’s Gymnasium has served the Provo community for over a century thanks to locals invested in the building and its history. 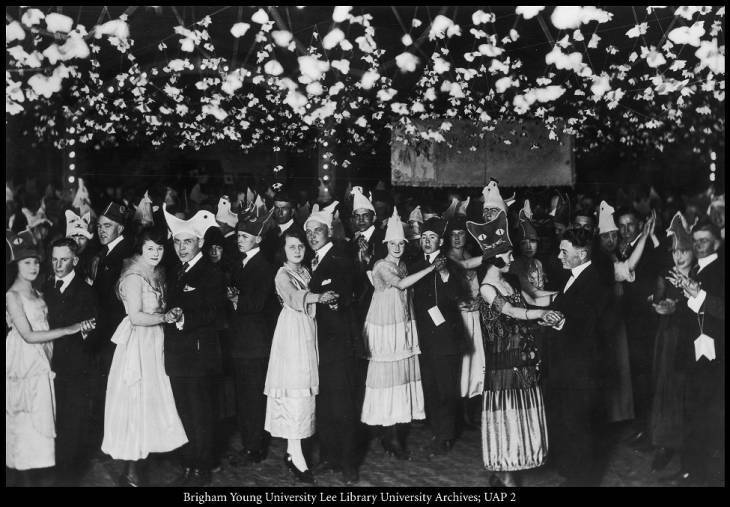 In the early 1900s, BYU sporting events and dances were held in the Training Building and BYU High School. In 1912, President George H. Brimhall acknowledged that a new building was needed to accommodate the growth of the school. He set aside the corner of University Avenue and Fifth North for a new building that would hold both women’s sports and social events. The BYU Ladies’ Gymnasium was dedicated on Friday, September 19, 1913. During the day, the building was used for ladies sporting classes. Focused on facilitating athletics, the original building design included one hundred coil springs underneath the gymnasium floor. It did not work out as expected. Movement sheared off the nails, and blocks were used to hold the floor in place. Despite other problems and leaks, the building served the community well. The men’s basketball team later used the building for games because the bleachers in the Gymnasium held more people than the Training Building. At night, the Ladies’ Gymnasium was a center for social events. Dances on Fridays went from 8:00 p.m. to 11:00 p.m. and cost thirty-five cents for couples and ten cents for additional ladies. Some of the dances were very memorable. In 1925, a junior-senior dance was centered on the theme Wild West. So many blank cartridges were fired throughout the event that the neighbors complained about the noise. In that same year, BYU alumnus Dave Rust brought his two adopted cougar cubs to a dance, and there was some panic in the Gymnasium when Cleo and Tarbo were released onto the floor. 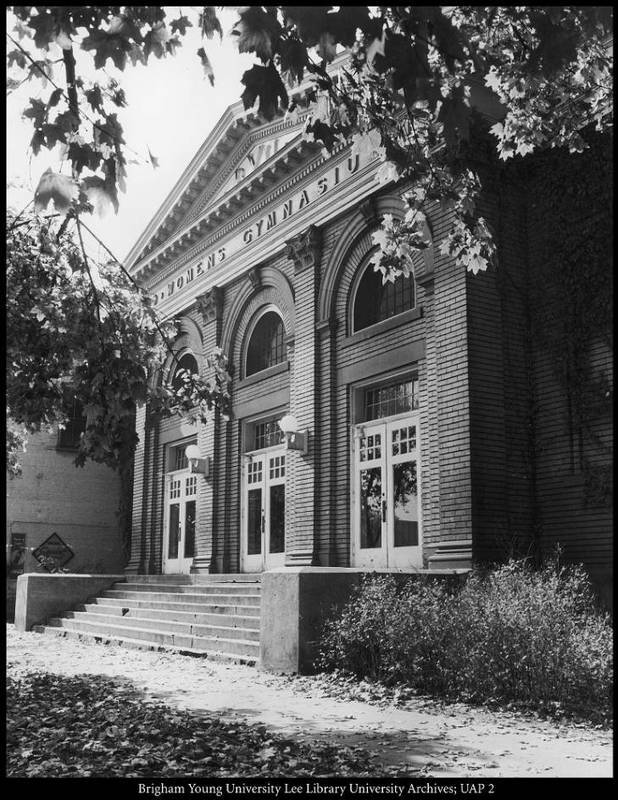 In the early thirties, the term women replaced the term ladies, and community members began referring to the building as the Women’s Gymnasium. 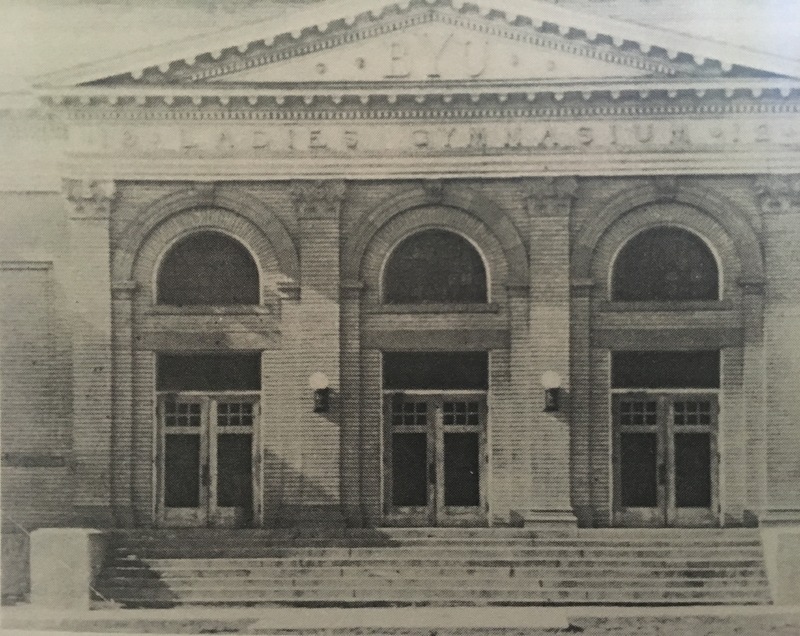 When it was built, the building was labeled Ladies’ Gymnasium in metal lettering, so President Harris scheduled for the letters to be changed to match the trend. The new name remains on the building today. The Women’s Gymnasium held more than social and sporting events over the years. During World War I, The Army Training Corps occupied the building for several months, and the outbreak of Spanish Influenza across the country caused them to be quarantined during their stay. During World War II, the United States Air Cadets lodged in the gym for a short time. They were moved to another site because of the growing number of female students that needed the building for classes. The building continued to serve as a women’s gymnasium for several decades. In 2007, the Women’s Gymnasium was scheduled for demolition to make way for a new Zion’s National Bank. Leslie and Michael Gledhill came forward and bought the Gymnasium for $1 million. Leslie had an attachment to the building, having herself spent afternoons there as a child watching college girls during their gymnastics lessons. The couple had the bricks power scrubbed and the inside polished. The original floor was left to preserve the building’s character. The Gledhills saved the building and turned it into the headquarters for their online thrift store: Cherry Lane Keepsakes. In 2016, the building was sold to Case Lawrence, the owner of Circus Trix. Another $1 million was spent in renovations to make the building a corporate office. Lawrence showed a dedication similar to the Gledhills when he said, “I firmly believe that the best way to preserve a building is by making it relevant for the modern day.” When the original windows and doors were replaced during the renovation, Provo City halted the construction. Despite controversy over preservation, renovations continued and the Women’s Gymnasium gained a new look with a patio cover. The century-old BYU Women’s Gymnasium has been kept relevant in Provo by leaders and business owners who value the building’s character and ability to serve the needs of the community. Ladies Gymnasium 1912 West of Lower Campus ~ Source: Miller, Karl A. History of Buildings and Grounds: Brigham Young University. 1989. 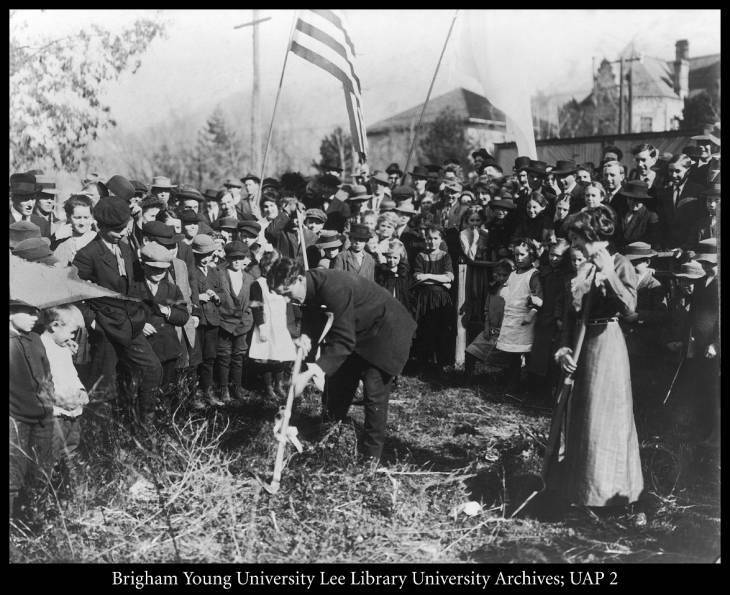 Groundbreaking for the Women's Gymnasium, November 6, 1912 ~ Source: Brigham Young University News Bureau, from Digital Collections BYU Library. “Groundbreaking for the Women's Gymnasium, November 6, 1912,” available at https://contentdm.lib.byu.edu/digital/collection/BYUPhotos/id/190/rec/12. The "Fools' Frolic" in the Women's Gymnasium, 1920: This was the "Fools' Frolic" of 1920 in the Women's Gymnasium, reported as "a smiling success, biggest High School event of the year." Programs dangle from the wrists of several dancers. In those days partners for all dances were scheduled on the small cards, with the first and last dance usually reserved for one's date, a custom that went out of style in the 1960s. ~ Source: From Digital Collections BYU Library. “"The Fools' Frolic" in the Women's Gymnasium, 1920,” available at https://contentdm.lib.byu.edu/digital/collection/BYUPhotos/id/284/rec/11. Cougars "Cleo" and "Tarbo," 1925: The somewhat tame cougars, "Cleo" and "Tarbo," were well known on campus during 1925-26. Some panic resulted when they were released on the floor during a dance in the Women's Gymnasium. Courtesy of Dr. Mark K. Allen. ~ Source: Allen, Mark, from From Digital Collections BYU Library. 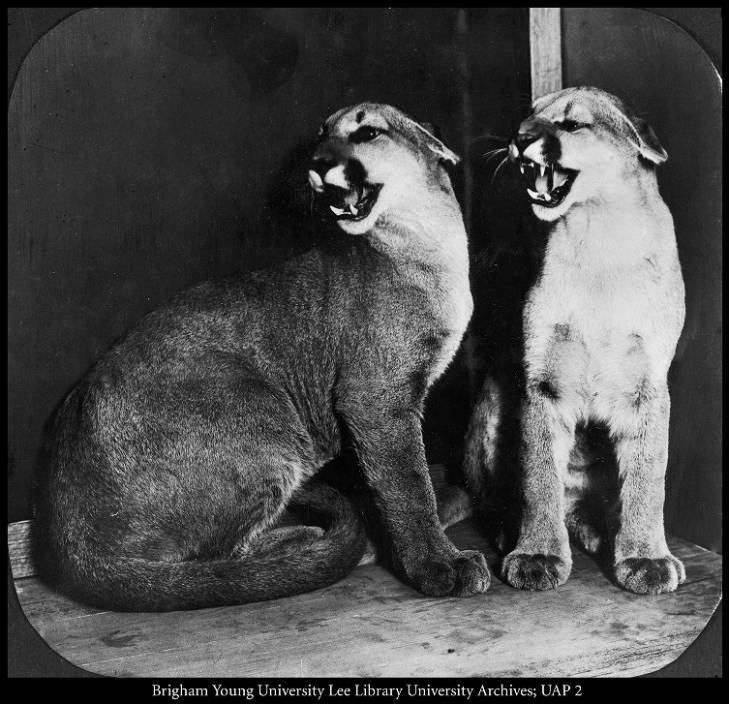 “Cougars ‘Cleo’ and ‘Tarbo,’ 1925,” available at https://contentdm.lib.byu.edu/digital/collection/BYUPhotos/id/383/rec/8. Wild West party in the Women's Gymnasium, 1925: The junior-senior Wild West party in the Women's Gymnasium in 1925, punctuated by much firing of blank cartridges, was so noisy the neighbors complained. Courtesy of Dr. Mark K. Allen. ~ Source: Allen, Mark K., from the Digital Collections BYU Library. “Wild West party in the Women's Gymnasium, 1925,” available at https://contentdm.lib.byu.edu/digital/collection/BYUPhotos/id/385/rec/10. Women's Gymnasium, ca. 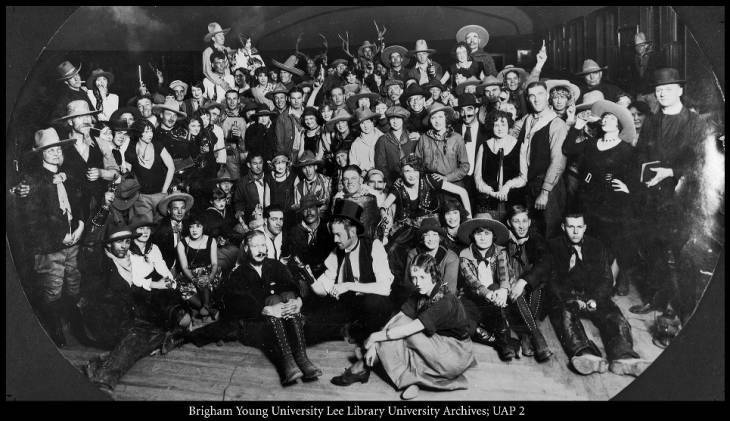 1930 ~ Source: Brigham Young University News Bureau, from the Digital Collections BYU Library. “Women's Gymnasium, ca. 1930,” available at https://contentdm.lib.byu.edu/digital/collection/BYUPhotos/id/192/rec/2. Dr. Leona Holbrook and Some of Her Students on the Mezzanine of the Women's Gymnasium, 1930s ~ Source: From the Digital Collections BYU Library. “Dr. 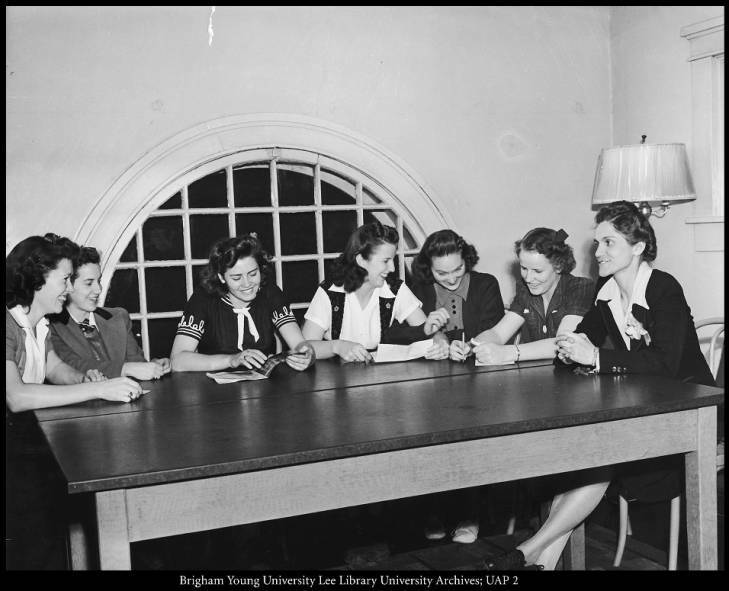 Leona Holbrook and some of her students on the mezzanine of the Women's Gymnasium, 1930s,” available at https://contentdm.lib.byu.edu/digital/collection/BYUPhotos/id/450/rec/1. B.Y.U. Meets Utah in Big Seven Fracas at ‘Y’ Gym Tonight ~ Source: Provo Evening Herald. “B.Y.U. 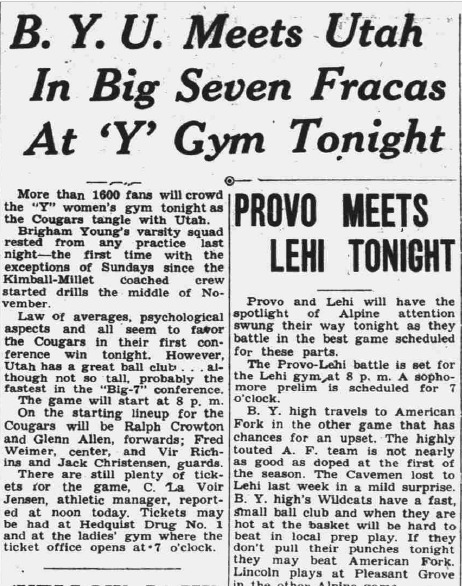 Meets Utah in Big Seven Fracas at ‘Y’ Gym Tonight,” January 20, 1939. Available at https://newspapers.lib.utah.edu/details?id=22694420&q. 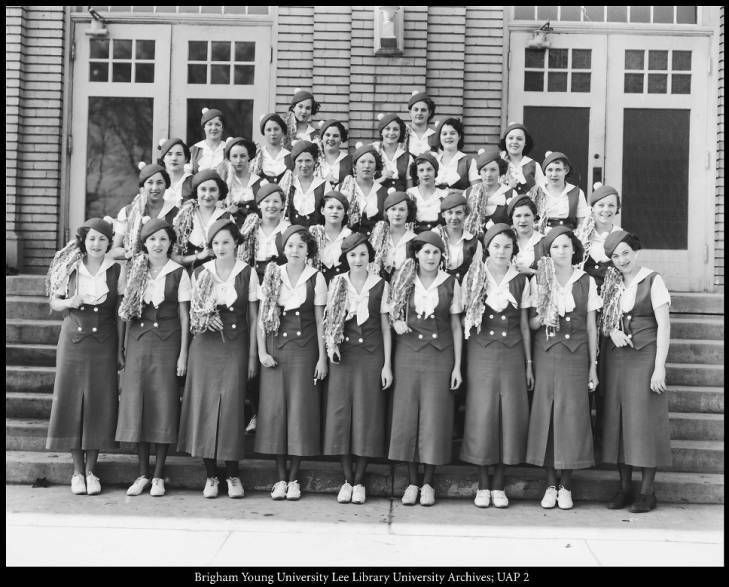 Pep Group of Coeds on the Steps of the Women's Gymnasium, 1930s ~ Source: From Digital Collections BYU Library. “Pep group of coeds on the steps of the Women's Gymnasium, 1930s,” available at https://contentdm.lib.byu.edu/digital/collection/BYUPhotos/id/432/rec/6. Physical Education Class in the Women's Gymnasium, 1955: The Women's Gymnasium on lower campus served for physical education classes even after construction of the Fieldhouse in 1951, as seen in this 1955 photograph. ~ Source: Digital Collections BYU Library. “Physical education class in the Women's Gymnasium, 1955,” available at https://contentdm.lib.byu.edu/digital/collection/BYUPhotos/id/547/rec/15. 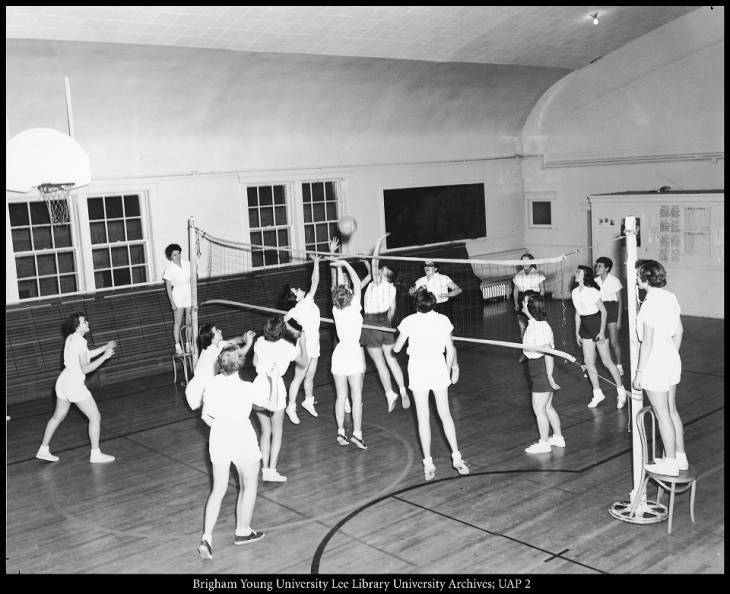 Emily Cook, Brigham Young University, “Women's Gymnasium,” Intermountain Histories, accessed April 19, 2019, https://www.intermountainhistories.org/items/show/195. Butterworth, Edwin. Brigham Young University 1,000 views of 100 years. Provo, UT: Brigham Young University Press, 1975. Hatch, Ephraim and Karl Miller. Brigham Young University: A History of the Campus and the Department of Physical Plant 1875 – 1975. Provo, UT: Physical Facilities Division, 2001. Hulet, Clara. ElevenNEWS at Noon. “Controversy over Historic BYU Women’s Gym,” March 13, 2017. Available at http://elevennews.byu.edu/2017/03/controversy-over-historic-byu-womens-gym/. Israelsen-Hartley, Sara. Deseret News. “Old Building, New Use: Couple Turns BYU Women's Gym into Showcase for Internet Business,” December 8, 2007. Available at https://www.deseretnews.com/article/695234220/Old-building-new-use-Couple-turns-BYU-womens-gym-into-showcase-for-Internet-business.html. 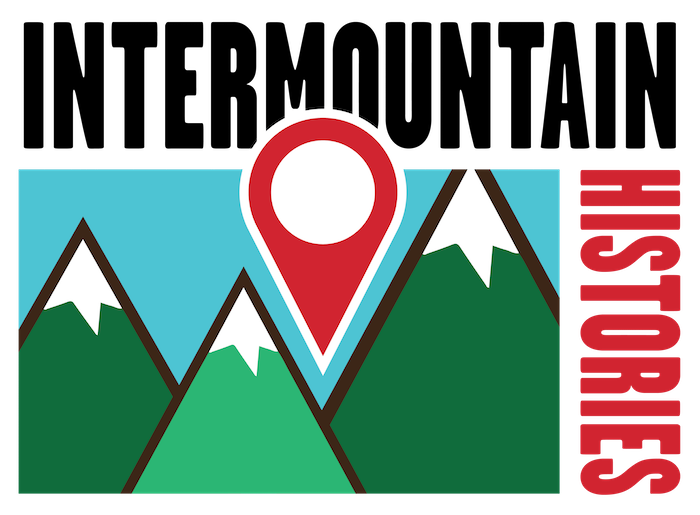 Martin, Denise, from Provo-Utah: The Best Guide to Provo Utah. “Historic BYU Women’s Gym – Circle Trix Headquarters Provo, UT,” available at http://www.provo-utah.us/byu-womens-gym.html. Miller, Karl A. History of Buildings and Grounds: Brigham Young University. 1989. Provo Evening Herald. “Training School Jamboree Tuesday,” May 23, 1938. Available at https://newspapers.lib.utah.edu/details?id=22692537#contents.